Demanding industrial environments benefit from having backup mechanisms in place to contain problems if the first line of defense fails. 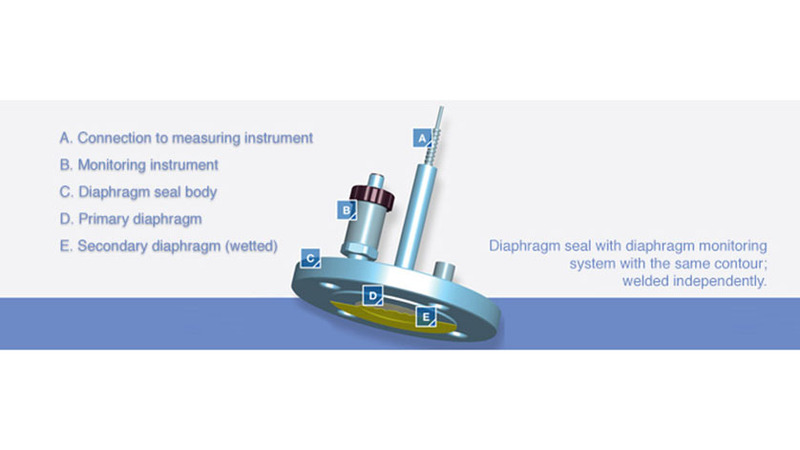 This is the principle behind the WIKA Diaphragm Monitoring System, which features a double-diaphragm seal. Diaphragm seals use a thin, flexible piece of metal to separate the process medium from the working parts of the gauge. As the name denotes, double-diaphragm seals have two diaphragms to provide protection from corrosion, heat, clogging, and other conditions that can cause a gauge to malfunction or break down. These seals typically are also equipped with a monitor to alert the operator if a break in the seal occurs. The WIKA patented double-diaphragm seal consists of two diaphragm seals, separated by a vacuum and monitored by a sensor. If the vacuum breaks, an alarm alerts plant personnel to take corrective action before the problem gets out of hand — a feature known as break monitoring. The break-monitoring alarm can be visual, electrical, or acoustic, depending on user requirements. In truly demanding settings such as chemicals manufacturing, corrosive substances can wear down even the toughest diaphragm. Such a compromising situation can lead to inaccurate pressure readings, or worse, spills and leaks. The audible, visual, or electrical alarm on the double-diaphragm seal prevents this from happening. The alarm alerts plant personnel when the seal needs to be changed. Processes that use corrosive substances, such as hydrofluoric acid (HF) and pharmaceutical market are tailor-made for double diaphragm seals. HF is used to make chemicals that, in turn, make up a wide range of consumer products. HF is both highly toxic and extremely corrosive. During one recent instrument audit, WIKA discovered just in time that HF had eaten through the diaphragm seal on a pressure gauge. To keep the problem from recurring, WIKA installed its double-diaphragm seal with break monitoring. Double-diaphragm seals also play a key role in industries that require a high degree of purity, such as pharmaceutical manufacturing. They are also applicable in any industrial application where system-integrity monitoring is necessary. One example of this might be foods processing. As industries become ever more competitive and their processes more sophisticated, equipment and plants often operate on a 24/7/365 basis. This creates constant wear and tear on instruments and increases the potential for problems or breakdowns. In such environments, industrial users must depend even more on accurate readings from their pressure-measurement instruments. Double-diaphragm seals help ensure continuous production and minimize downtime and shutdowns. Wherever they are used, double-diaphragm seals should always complement – not replace – rigorous operational and safety protocols. Need more information on double-diaphragm seals? This WIKA guide on diaphragm seals can help. Or contact WIKA’s Diaphragm Seal Technical Team for additional advice and assistance.